In 2007, I got back into photography in a more serious way using the birth of my first grandchild as a bit of an excuse to get a “good” camera. That camera was a Canon 30D – and it served me well for a couple of years before I upgraded to a 40D and then, ultimately a Canon 5D Mark II. The 5D marks the end of the road for me with Canon – as I’m selling all of my Canon lenses and the 5D body to make way for the new mirrorless cameras from Fujifilm – but that’s another story. In June 2008, I went to the helicopter airshow that used to be held at San Carlos Airport. 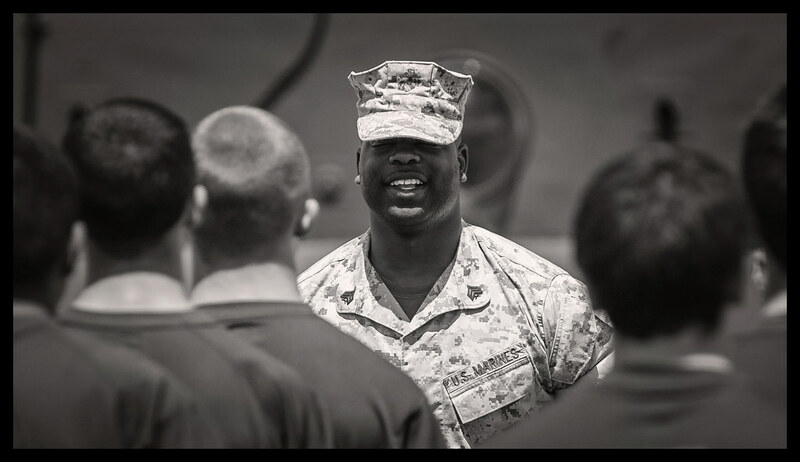 One of the events that day was an enlistment ceremony conducted by the US Marine Corps. Here’s a shot, processing in black and white with a touch of platinum toning, from that ceremony.